Your podiatrist is qualified to fully assess the cause of pain in your ankle, knee, hip or back and to proceed with treatment if the problem lies in the foot or with the position of the lower leg. Your podiatrist can also evaluate suspected problems with posture or biomechanics. 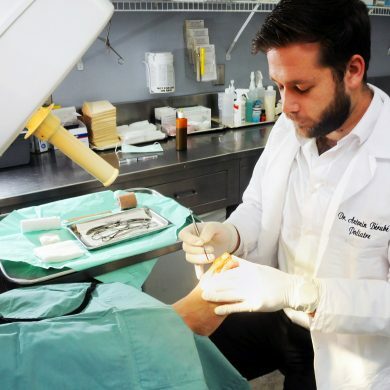 Depending on the situation, the podiatrist may be able to perform a diagnostic ultrasound on-site or prescribe a tomography (scan) or magnetic resonance imaging (MRI), or various examinations that are needed to make an appropriate diagnosis. Your podiatrist may recommend a foot orthotic, a simple heel lift or modifications to your footwear and may perform any surgery that is required. If necessary, your podiatrist can refer you to the appropriate health specialist. Need surgery? No need to reserve a hospital room. Clinique podiatrique Simoni Therrien has a top-tier operating suite and surgical team qualified to perform major foot surgery (including for bunions and hammer toes) as well as minor operations (such as for ingrown nails). Our surgical protocols include a thorough follow-up after the operation. Your time is precious, so we have a foot and ankle radiology department right here at the clinic. 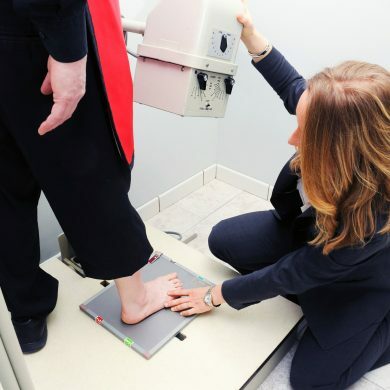 Within minutes, an X-ray can be taken, developed and examined by a podiatrist. The result is a quicker diagnosis and earlier treatment. New acquisition: diagnostic ultrasound! This type of ultrasound allows us to see tendons, ligaments, joint capsules and other soft tissues in real time. 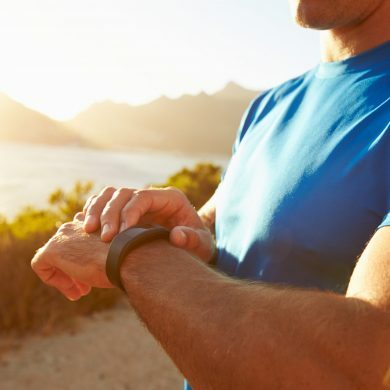 It can even sometimes detect stress fractures much faster than radiography. Moreover, it allows us to perform echo-guided injections with great precision. A newborn’s foot is formed entirely of cartilage, a malleable tissue that will be transformed into bone through a long and complex process. The bone mass of the foot is formed by about the age of 3 but is not fully mature until sometime between the ages of 18 and 21. This means that children’s feet require special care, not only before the age of 3 but until the child has fully grown into an adult. Generally speaking, good posture and preventive exercises are sufficient to ensure proper development of the feet. In some cases, however, the podiatrist needs to intervene to correct existing or potential problems. We offer an extensive care protocol that includes surgical debridement and the application of advanced products for the treatment of diabetic sores. Our professionals use laser therapy to aid the body’s natural healing process that acts on the different phases of healing. Orthotics are specially designed for the diabetic foot and personalized for each patient. A plantar orthotics may be recommended, as well as modifications to the patient’s footwear. There is a permanent procedure for painful nails that “grows” into the skin. This procedure is referred to as the matrixectomy which is performed under local anesthesia and consists in burning the matrix (root) of the nail chemically. Only the curved portion in the skin (a few millimeters in width) is removed allowing an esthetic result.